First of all I don’t like having to play a song exactly the same way every time. If I am enjoying a song, the crowd is getting into it and people are dancing I want to have the ability to extend the song, play a longer instrumental bit or add an extra chorus. As a performer you are controlled by the pre-recorded backing track, when ideally it should be the other way around. With a backing track if you miss the first line of a verse, it’s gone forever and you have to come in on the second line. Sometimes if you can’t hear the sound clearly on stage, and / or the crowd is very noisy, it’s too easy to lose your place in the song. And the worse thing about backing tracks is that many of them sound like bad karaoke versions of the real thing. The individual sounds and instruments are usually mixed in such a way that they sound good with vocals added, but not with guitar, so sometimes you might as well be doing karaoke. I’ve got nothing against karaoke per se, but the point of it is that different people get up and have a go, it gets boring if one guy has the microphone all night, even if he is a good singer! Despite all this knocking of backing tracks however, I’m not trying to say that the combination of effects that I use to get my live sound is much better. At best I consider it a stepping stone to the live sound that I want to achieve but am still in the process of developing. I use this pedal mainly to play drum loops. It has the ability to do much more, but I have found it to not be very practical to do much on stage with. It is probably more useful and versatile as a practice and writing tool. 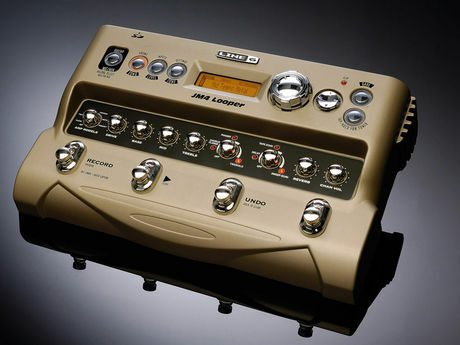 It works as a basic looping pedal for the guitar in the sense that you can press the record button at the start of a verse, it will record what you play, then when you hit the stop button it plays back what you just played, leaving you free to play something different – like a lead break, for example, over the top of what you just recorded. However you are pretty much stuck with the same sound, you cannot for example record a clean-sounding chord pattern, then when it repeats play a distorted guitar sound over the top. You can change the sound, but first of all you have to bend down and change the settings by hand, and if you do this it also changes the sound of what you just recorded at the same time. So if you added distortion, the clean-sounding chord pattern you just recorded will also have distortion added. Maybe there might be a way to do what I want, but I haven’t been able to figure it out! Firstly they have a 4 beat count in before the drums actually start, so you have to press the start pedal exactly 4 beats before you want the drums to come in. Not always easy to do when you’re trying to sing, play the guitar, keep control of the other foot pedals, and catch the eye of the cute girl by the bar all at the same time! Secondly, the built in drum patterns have some variety, which makes it sound a bit more interesting than 4 bar loops that repeat themselves all the way through the song. But personally I would rather have this than have a drum roll come in in a totally inappropriate place – halfway through a line perhaps – and the drum pattern amp up to a more intense level just when you’re getting to a quieter part of the song! As the drum loops are a little boring, I find I have to use the guitar and vocals to add dynamics to a song, more than I would if I was playing with a real band. 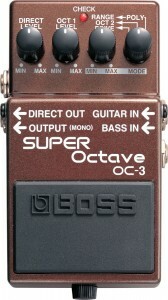 The other advantage of the JM4 is that it has good compression, it mainly balances the bass sound that I get from the Boss OC3 Super Octave pedal (below) as well as smoothing out the guitar sound a little. This is a great pedal that I also don’t use to it’s full capacity, but for what I want it works well for the moment. You plug the guitar into it and it adds the sound of a bass guitar, an octave below the lower strings of the guitar as you play the notes. You can set the range to denote which of the lower guitar notes will produce the bass sound. The disadvantage of this is that the lowest note on the guitar produces the loudest bass note, then the bass gets progressively quieter as you play higher notes. Thus on some chords (E, G and A in particular) the bass is loud, whilst on a D chord it is quieter. However I use the JM4’s compression as mentioned above and this reduces the difference between the loud and quiet bass notes a little. I set the range so that it makes the bass sound on the octave from low E (6th string) up to the D and E on the 4th string. The disadvantage of this is that if you play more than one different note at the same time in this range, the sound is rumbly and overly loud. So when I play a G chord, for example, I have to mute the B note on the 5th string. When I play an F chord I have to mute the C note on the 5th string. It has taken a little while to get used to but I have adapted my playing to suit this situation. The pedal can also produce notes 2 octaves down, and is sometimes used by lead guitar players to add body to a high lead break. But as I don’t really do lead breaks in the traditional sense at the moment, I don’t use it for that. This pedal has added a whole new dimension to my sound. You plug both the vocal microphone and the guitar into it, and it ‘listens’ to both and simultaneously re-samples your voice creating up to 2 versions of your vocal line that are in harmony with the guitar chords. These harmonies actually follow the pattern of your main vocal line pretty much just like traditional vocal harmony patterns do. You can even have the harmonies sound male or female, and there is a ‘humanize’ knob that when turned up makes the harmonies sound not so perfect. I find I have to set the harmonies to be noticeably lower in volume than my main vocal, otherwise they can sound a bit unnatural. The most natural harmony the pedal produces is the one that is usually a third higher and of the same gender. The lower harmonies and those that are a fifth or more higher can sound a little unnatural and thus I use them sparingly. The harmonies are also not quite natural enough for me to use for recording, but for live gigs they can really add dynamics and extra dimension to a song’s chorus. 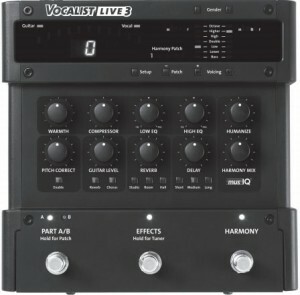 The Vocalist Live3 also has compression, useful to give a little more body and balance to the voice volume levels. I use a basic Shure SM58 vocal microphone which previously tended to distort a little if you got too close to it. With the compression on this pedal those peaking notes are compressed enough to eliminate this distortion. The one downfall of the pedal as far as I am concerned are the effects. I would like to have a very small amount of reverb and perhaps a little delay on the vocals, but these effects on this pedal are just not subtle enough to use live. I rely instead on my PA system to give me a little bit of reverb. But other than that I would highly recommend this pedal for solo singers.